The Museum of London has completed a £20m redevelopment, opening the doors on five new interactive galleries that recount 350 years of London history. The Modern Galleries of London, which open on Friday, take visitors from the Great Fire of 1666 to the present day. The Museum said it hopes the lottery-funded project will place it at the heart of the capital for both Londoners and tourists ahead of the Olympics. Over 7,000 items, including a Georgian pleasure garden, will be unveiled. Five gallery spaces were completely remodelled in the three-year project and a glass-wall extension added to the museum's north wing, where the extravagant Lord Mayor's Coach will now be on view from the street for the first time. 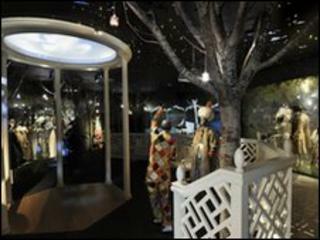 The reconstructed Georgian pleasure garden, which is one of several interactive exhibits that "expose" London society as it was, boasts several models decked out in hats and masks designed by renowned milliner Philip Treacy OBE. In another room called Capital Concerns an interactive model of the River Thames will ask visitors their opinion on the current challenges that London faces, such as how high it should responsibly build. The organisers behind the project, which received a £11.5m lottery grant, also hope the galleries will help create a future London legacy worthy of the 2012 Olympics. Director of the Museum of London Professor Jack Lohman said: "The new Galleries of Modern London breathe new life into the museum, bringing together over 7,000 objects from vehicles, costume, jewellery and paintings. "They provide a home for the story of London - celebrating the unique spirit and energy of the city ahead of the 2012 Olympics... transforming the museum and placing it at the heart of the city it celebrates." Dame Jenny Abramsky, chair of the Heritage Lottery Fund, said: "The Galleries of Modern London tell the fascinating stories of one of the world's most vibrant capital cities. "This redeveloped space shows how the past can be opened up to the present resulting in an imaginative set of new galleries which will be enjoyed by both Londoners and tourists alike." The museum will stay open until 2100 BST on Friday to mark the launch.